The Dayva International Premier Series 11 ft Stainless Steel Market umbrella is a commercially rated umbrella that will provide you with the perfect shade for your patio, while protecting you from the sun's harmful UV rays. Constructed from Stainless Steel, this umbrella has eight fiberglass ribs and has a polished finish for a beautiful and durable umbrella. The one piece frame has a 1-1/2 inch diameter pole and is easily opened and closed using a manual double pulley lift system; which is secured by a simple brass plated pin. 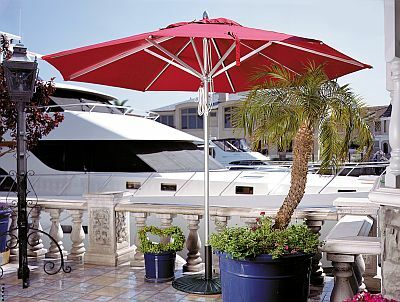 This stylish umbrella provides 78 inches of head room with a octagonal canopy that opens to 11 ft in diameter. 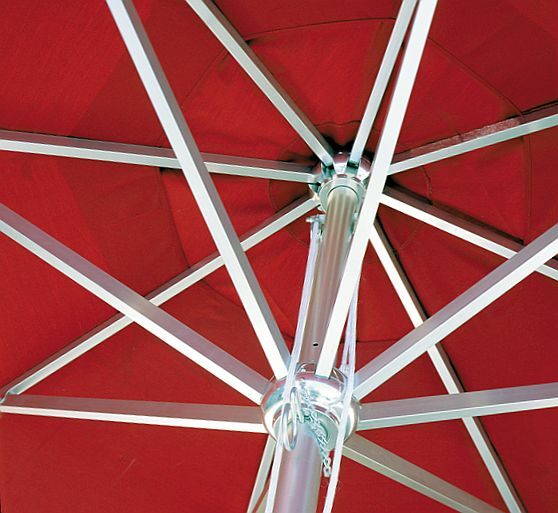 The canopy is durable Sunbrella fabric and is available in a variety of colors. The Sunbrella fabric includes a Three Year manufacturer warranty. If you need 10 or more umbrellas please contact us about quantity discounts. Head Room (Base to Peak): 78"